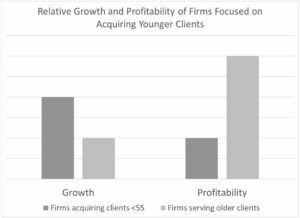 Firms that focused on adding younger clients (under 55 years old) grew 2x faster than other firms…but were 1/3 less profitable than those serving older clients. This is hardly surprising, as older clients have more assets and are likely to have settled into a consistent servicing process. The challenge is that attracting younger clients is necessary for the long-term health of the firm. Moreover, the asset profile of younger clients is not really something that firms can control so it’s difficult to affect the revenue side of the profit equation. That leaves firms with a need to reduce the costs of acquisition and servicing. The promise of fintech offerings – software that handles functions like client onboarding, risk assessment, financial planning and portfolio management – is to deliver cost savings through automation and digitization of these manual, time-consuming processes. The result: improved profitability. The problem is that fintech only solves problems once it is successfully implemented. Until that point, it is an investment without a clear return. Even more importantly, software represents a solution for advisory firms, not necessarily their clients. There is a lot of wishful thinking behind the assumption that younger investors will universally embrace technology solutions. In fact, a recent survey of millennials (supported by other surveys as well) reveals that they WANT human interaction. This isn’t to say that there aren’t plenty of opportunities for firms to introduce cost-saving technology AND enhance the client experience. The client onboarding process – e.g., capturing and transferring of financial documents – is a great example how software can facilitate a quick, smooth transition and lead to greater client satisfaction. But one example does not make the case. Moreover, even software that sits at the “sweet spot” of client experience enhancement and firm cost savings can be a false idol if it is difficult for clients to use. The point is that just because technology offers the potential for benefits doesn’t mean that it automatically will. Firms need to have a realistic view of the potential benefits and risks and have a game plan for minimizing the possible disruption of valuable client relationships. These efforts will go a long way to ensuring that the benefits that should accrue from technology don’t get eroded by unanticipated problems.